Neon orange poppies appeared in clusters along the Silverado Trail as I drove to Stag’s Leap Vineyard on a breezy April day. The sky was a clear porcelain blue, not as vibrant in hue as it would become in the hotter Summer days ahead, and the temperature matched the Spring season with a moderate 68F. Vineyards marched along both sides of the two-lane road, their foliage a pale green blur with small leaves only a few weeks past bud break. I drove slowly, just below the speed limit so I could enjoy the expansive view. 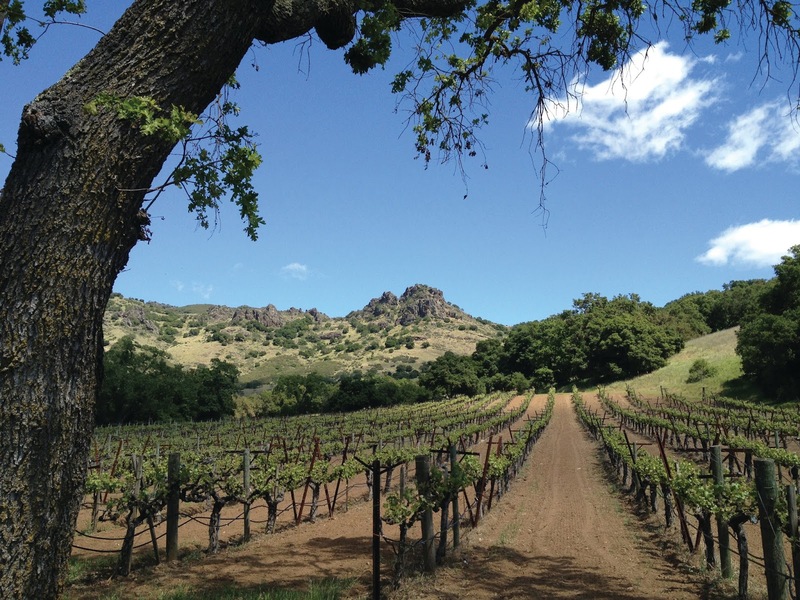 April is still a relatively calm month in Napa in terms of tourists, and the Silverado Trail, running parallel to crowded Highway 29 on the opposite side of the narrow valley, usually has much less traffic, and so is a preferred route of many locals. However, despite the lack of traffic, my leisurely speed ended up irritating other drivers who sped up to pass me. The turn off to Stag’s Leap Wine Cellars appeared suddenly, obscured slightly by large trees on a gentle turn in the road. Then I saw the sign announcing the famous vineyard, home of the cabernet sauvignon wine that won the Judgment of Paris tasting in 1976. After parking my car underneath some trees in the shady parking lot, I entered the tasting room where I was scheduled to meet Kirk Grace, vineyard manager. Since I was a few minutes early, I perused the merchandise and was delighted to find a large pile of George Taber’s book, The Judgment of Paris, detailing how an unknown wine brand from California, the 1973 Stag’s Leap Wine Cellars Cabernet Sauvignon, had beat out grand cru Bordeaux wines in a blind tasting in Paris France in 1976. The results of the tasting were publicized by Time magazine, and put Napa Valley on the world map as a top quality wine region. 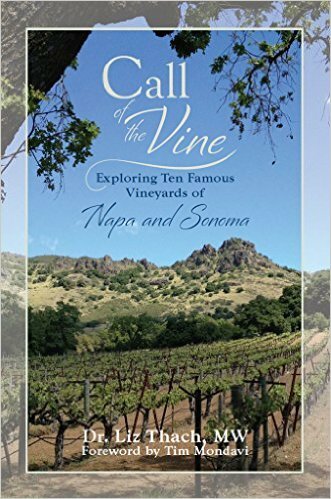 Though, I had read the book several years ago, I picked up a copy and was soon so engrossed in the chapter on Stag’s Leap Wine Cellars that I was caught off guard when a tasting room representative brought me a glass of sauvignon blanc to sip while I was waiting. The wine was fragrant and delicious, and I was enjoying both the beverage and the book when Kirk arrived. “Hope you weren’t waiting long,” he said as he reached out a hand in greeting. He was dressed in the standard California vineyard manager wardrobe of blue jeans and work boots, complemented by a green checked shirt. He seemed to bring a breath of the outdoors into the tasting room. Kirk glanced at the book and smiled. “Yes, great reading.” I noticed that he had light blue eyes in a tanned face, and the silver wings in his short sandy hair gave evidence to his many years of experience, including managing the vineyards of both Sterling and Sinskey wineries before moving to Stag’s Leap Wine Cellars seven years earlier. He had a degree in Crop Science from Calpoly, and an extensive background in environmental science. 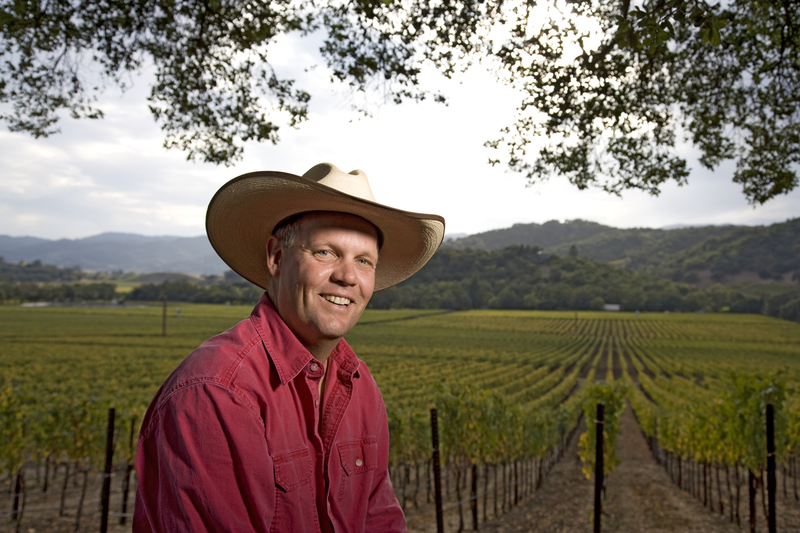 A native of Napa Valley, his parents had founded Grace Family Vineyards, so Kirk had grown up immersed in local agriculture issues. “Where would you like to start today?” he asked. “S.L.V.,” I said, using the shortened name for Stag’s Leap Vineyard. “Definitely!” FAY was the original vineyard that had inspired Warren Winiarksi, the founder of Stag’s Leap Wine Cellars, to plant S.L.V.. It was in the late 1960’s that Warren Winiarksi had the epiphany that led him to plant Stag’s Leap Vineyard. A former professor, he had been working in Napa Valley as a consulting winemaker and grape grower for several years, and was on the look-out for a property that he and his wife could purchase in order to start their own winery. One day he was visiting with Nathan Fay who owned a small cabernet sauvignon vineyard in the Stags Leap District just north of the town of Napa off the Silverado Trail. Nathan offered him a glass of wine made from his vineyard, and it changed Warren’s life. Warren was transfixed by the experience and immediately began to look for property near Nathan Fay’s vineyard. Fortuitously, the 50-acre Heid Ranch next door was for sale, and Warren was able to purchase it for $110,000. He then set to work clearing the land of plum trees, and in the Spring of 1970 planted Stag’s Leap Vineyard with two-thirds cabernet sauvignon vines and one-third merlot. Warren tended the vineyard carefully over the next three years, then in September of 1973, when the vines were of sufficient age to make quality wine, and the growing season had been nearly perfect, he hired a crew of pickers to assist with the harvest. Over a five-day period, they picked 32 tons of grapes from the vineyard, and Warren hired his good friend, Andre Tchelistcheff, to provide advice in the winemaking process. The grapes were fermented in individual lots and aged in French oak. The final blend was 90% cabernet sauvignon and 10% merlot, and the wine was released to the market in July of 1975. There were a total of 1800 cases produced and it was named the 1973 Stag’s Leap Wine Cellars Cabernet Sauvignon. It was this wine that Steven Spurrier, a British wine merchant living in Paris, selected as one of six California red wines to compete in a blind tasting against famous French wines. Surprisingly the Stag’s Leap wine came in first, winning out against the great Bordeaux wines of Chateau Mouton Rothschild, Montrose, Haut-Brion and Leoville-Las Cases. Even more amazing was the fact that all of the judges were well-known French experts in wine and cuisine. When the results were announced they “had a revolutionary effect, like a vinous shot heard round the world” wrote Barbara Ensrud in the Wall Street Journal. Overnight, Napa Valley became known as a famous wine region, and Stag’s Leap Vineyard was recognized as one of the most legendary plots of land in the world. 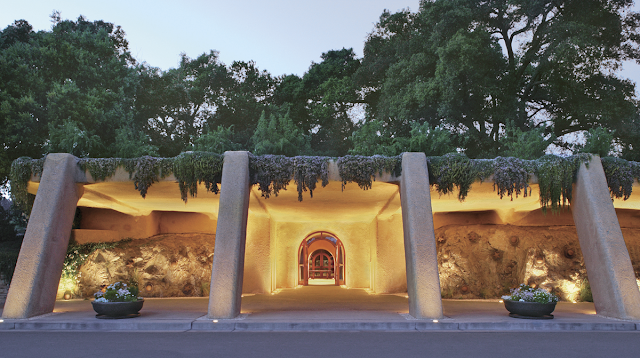 In 2007 Warren retired and sold the winery and vineyard for $185 million to Ste. Michelle Wine Estates in Washington in partnership with Marchesi Antinori. Today the winery continues to produce the S.L.V. Cabernet Sauvignon from 35 acres of cabernet sauvignon and 1.5 acres of merlot, though the original 1970 vines have been replanted. Kirk ushered me into a large four-door silver pick-up truck parked behind the tasting room, and soon we were driving down a small gravel road and into the front section of Stag’s Leap Vineyard. Gazing out the window, I was impressed with how green and healthy all of the vines looked. They were organized in straight rows with the trunks about three feet tall and long cordons on each side trained to a VSP trellis system. Bright new green leaves flared on shoots that ranged from two to six inches in length. Between every other row a carpet of short green grass with tiny yellow wild flowers spread out in long strips, while the opposite rows showed bare brownish-red soil. It looked like a luscious field of striped saltwater taffy. Kirk steered the large truck around a curve in the road and I noticed that we were closer to the craggy knoll that rose tall and sandy colored above the back of the vineyard. I knew these were called the Palisades, and they were an impressive range of rocky ridges that gave proof to Napa Valley’s volcanic past. I jumped down from the truck and walked quickly towards the wide rows of big, shaggy vines. They stood with outstretched arms, and with the shorter green foliage of the season, looked almost like a group of eagles with wings unfurled, waiting to take off. A few of the vines had small holes in the wide trunks near the top of the cordon, which gave them the appearance of having a face. “What caused these holes?” I asked. Once again I was reminded of the wide diversity of wildlife that are attracted to vineyards, and live in a symbiotic relationship with the vines. Stretching out my hand, I touched the shaggy surface of the vine that had lived more than forty years, and felt the warmth of the sunshine on the bark. The new leaves were a combination of pale and medium-hued green, and small tiny shoots hinted at the grape clusters that would form and bloom in a few weeks. Glancing around I realized he was right, and that the vineyard was slightly higher where we were standing, and that the slope increased in height as the vines marched further towards stands of dark oak trees and the craggy mountains beyond. High above the vineyard were two large outcroppings of rocks with a narrow opening in the middle. “So is that the famous cleft in the mountain where the deer story happened?” I asked, pointing to the rocky cliffs.